It is well known that Dhanush is acting in Velraj's direction again after tremendous success of 'Velai Illa Pattathari'. Dhanush has been quickly working on almost all his projects and having wrapped up ‘Maari’ and he is working ardently for 'Velai Illa Pattathari 2', tentatively titled 'Tea Kadai Raja', which is going on in full swing. Directed by cinematographer turned filmmaker Velraj, the movie stars Amy Jackson and Samantha in female lead roles and Anirudh has composed music. Filmmaker K.S Ravikumar and Radhika Sarathkumar are play Dhanush's parents in this flick. It looks like Dhanush has two ladyloves in this film and one is that Amy Jackson involves his teenage love. Some sources say that his first love with Amy Jackson terribly fails and later he comes across Samantha, whom he marries. 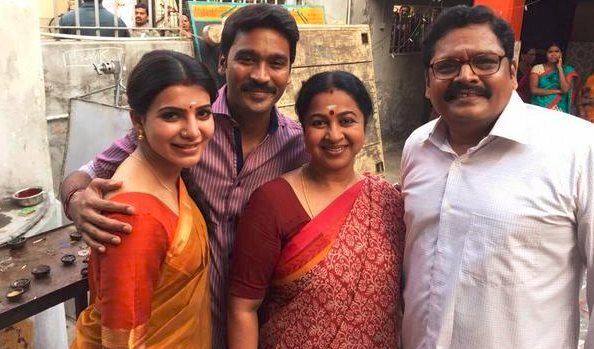 Recently, a scene was shot inside a temple, in which Dhanush offered prayers with his father, mother and spouse (Ravikumar, Radhika and Samantha, respectively). Let us wait for the more and more official confirmations on this and for now, it’s a buzz. Meanwhile, Dhanush has even completed dubbing for ‘Maari’, directed by Balaji Mohan that stars Kajal Aggarwal in female lead. Anirudh has composed music for this film and has shaken legs for the title song. The audio launch of Maari is happening on May 25, which is produced by Sarath Kumar and Radhika Sarathkumar under the banner of Magic Frames.